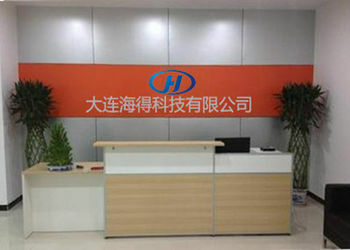 Dalian HedeTech Co.,Ltd. is located in Dalian, a beautiful coastal city in north of China. Hede is a high-tech chemical enterprise integrated with R&D, manufacturing and foreign trade, specialized in the supply of gas sampling bags,standard gas, gaspipe line fittings, valves, stainless steel gas sampling cylinders and related products. Our products are widely uesed in petrochemical industry, environmental protected inspecting, medical treatment and public health, scientific researches, and has been long-time used by the institutes of the major domestic petrochemical enterprises, Chinese Academy of Sciences, Academy of Agricultural Sciences, Chinese Academy of Forestry, and also many famous colleges and universities, each region of the environmental protection monitoring stations. At pressent, our company has gas preparation includes standard gas for petrochemical industry, environmental testing, combustibal gas detection, ship and instrument calibration; Mixed gas for laser,electric light, gas preservation and diving. Our electronic balances in using preperation of standard gas and mixed gas are all imported from Germany, and the preperation and quality detection & control of standard gas both implement national secondary standard material technology specification. 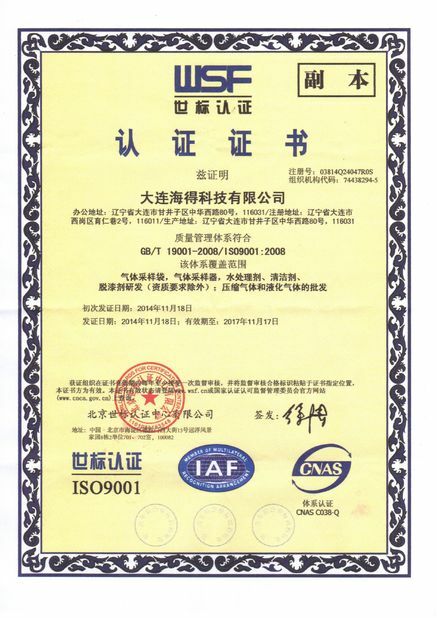 In 1999, our company named the bags special using in gas sampling and storage “gas sampling bags” in China first case, printing “GAS SAMPLING BAGS” on the bags, the name is proposed for the first time at home and abroad, and now it’s already generally recognized and adopted by customers at home and abroad. 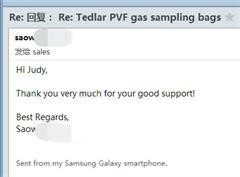 In 2002, our company made gas sampling bags using polyperfluorinated ethylene propylene film (Teflon®FEP by Dupont Co.) is China first case. Teflon®FEP film gas sampling bag is internationally recognized being the most excellent physical and chemical properties gas sampling bag. 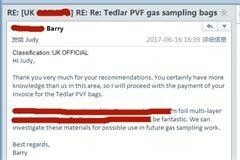 We are currently the only manufacturer which can use FEP film heat sealing to make gas sampling bags. After years of growth, we have now become a professional chemical manufacturer, supplier and exporter. Our product scope covers a wide range of chemical materials including gas sampling bags, valves and fittings, gas sampling cylinders and so on. Our philosophy is to give excellent sales, service, quality, and technical advice. We focus on customer service, a key ingredient of business, as well as high quality of products. We have gained our customers trust by providing high-quality products, competitive price, prompt delivery and professional services. We have established and developed worldwide partnerships with quantities of domestic and abroad enterprises. Our company also has its own large-scale warehouse and transportation fleet, a highly efficient logistics system and our products have been exported to South America, Middle East, South-east Asia and other countries. Based on manufacturing industry and focused on raw chemical business, we are steadily involved in global market. 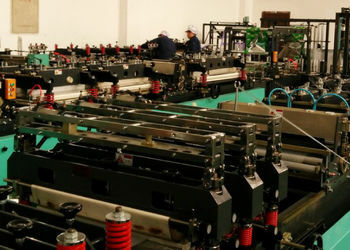 We are confident to be an international leading supplier with our comprehensive ability and core competitiveness. We offer volume discount, please contact us for details. After more than 10 years research, we have designed and developed the connections of gas sampling bags have received national utility model patent, and applied for Canada and US patent, with international leading level. our company named the bags special using in gas sampling and storage “gas sampling bags” in China first case, printing “GAS SAMPLING BAGS” on the bags, the name is proposed for the first time at home and abroad, and now it’s already generally recognized and adopted by customers at home and abroad. our company made gas sampling bags using polyperfluorinated ethylene propylene film (Teflon®FEP by Dupont Co.) is China first case. Teflon®FEP film gas sampling bag is internationally recognized being the most excellent physical and chemical properties gas sampling bag. We are currently the only manufacturer which can use FEP film heat sealing to make gas sampling bags. we have now become a professional chemical manufacturer, supplier and exporter. Our product scope covers a wide range of chemical materials including gas sampling bags, valves and fittings,gas sampling cylinders and so on. Our philosophy is to give excellent sales, service, quality, and technical advice. We focus on customer service, a key ingredient of business, as well as high quality of products. We have gained our customers trust by providing high-quality products, competitive price, prompt delivery and professional services. We have established and developed worldwide partnerships with quantities of domestic and abroad enterprises. 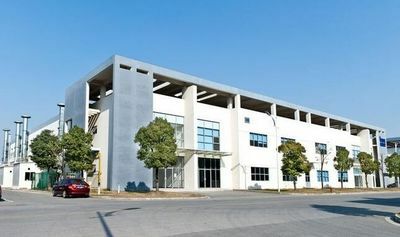 Our company also has its own large-scale warehouse and transportation fleet, a highly efficient logistics system and our products have been exported to South America, Middle East, South-east Asia and other countries. We wholehearted work so we are professional !